The nutrition label maker allows now to add an ingredient list and allergen declaration, as well as an address. The format and content of the ingredient label is regulated by the Code of Federal Regulations Title 21, section 101.4. You have to input the list of ingredients in descending order of weight, separated by comma. The common or usual name of the ingredients must be used usually. For more information, refer to the above regulation. You can also find a FAQ here. Note that the ingredient list must be on the same label panel as the allergen declaration and the name and address of the manufacturer, packer or distributor. 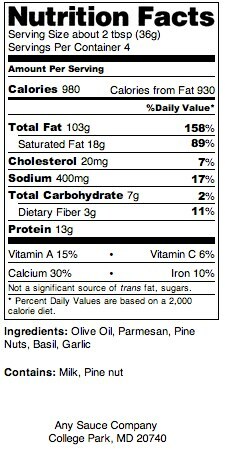 Make sure to include the allergen and the address on the nutrition facts panel as well if you select to include the list of ingredients. The format and content of the food allergens labeling is regulated by the Food Allergen Labeling and Consumer Protection Act of 2004 (FALCPA). For more information, see the FDA site. Under FALCPA, a major food allergen is included in the product of it contains any of the above food groups or protein derived from one of them. In the case of fish, crustacean shellfish and tree nuts, you must additionally specify the exact species or type. The allergen declaration does not have to be included on the label if the list of ingredients contains already the name of its major food allergens. If the name of the ingredient is different from the name of the allergen, it can contain its food source in parenthesis after the ingredient name. For example: whey (milk). However, you include the allergen labeling, you must list all the major allergens, even those already present in the ingredient list. Here is below lists of ingredients that may contain one of the major allergen. For more information, see also the site of the Food Allergy & Anaphylaxis Network (FAAN). The law defines any species in the genus Triticum as wheat. It includes grains such as common wheat, durum wheat, club wheat, spelt, semolina, einkorn, emmer, kamut, and triticale. Plan your Thanksgiving dinner with Shop’NCook Online Pro – for free!